Chaloux, Nick, Boisjoly, Genevieve, Grise, Emily, El-Geneidy, Ahmed, and Levinson, D. (2018) I only get some satisfaction: Introducing satisfaction into measures of accessibility. Improving accessibility is a goal pursued by many metropolitan regions to address a variety of objectives. Accessibility, or the ease of reaching destinations, is traditionally measured using observed travel time and has of yet not accounted for user satisfaction with these travel times. As trip satisfaction is a major component of the underlying psychology of travel, we introduce satisfaction into accessibility measures and demonstrate its viability for future use. To do so, we generate a new satisfaction-based measure of accessibility where the impedance functions are determined from the travel time data of satisfying trips gathered from the 2017/2018 McGill Transport Survey. This satisfaction-based measure is used to calculate accessibility to jobs by four modes (public transport, car, walking, and cycling) in the Montreal metropolitan region, with the results then compared to a standard gravity-based measure of accessibility. We then offer a dissatisfaction index where we combine the ratio between satisfaction-based and gravity-based accessibility measures with mode share data. 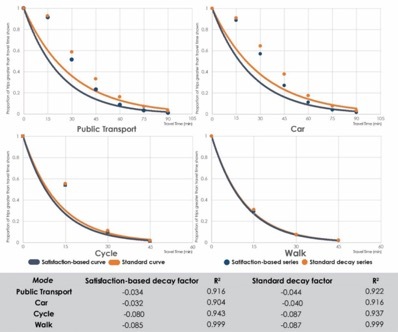 This index highlights areas with potentially high proportions of dissatisfied commuters and where interventions for each mode could have the highest impacts on the quality of life of a given mode commuter. Such analysis is then combined with a vulnerability index to show the value of this measure in setting priorities for vulnerable groups. The study demonstrates the importance of including satisfaction in accessibility measures and allows for a more nuanced interpretation of the ease of access by researchers, planners, and policy-makers.